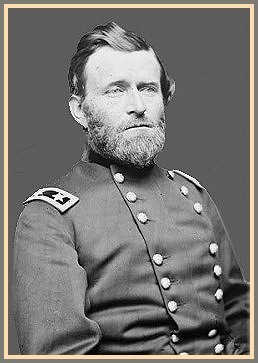 Born at Point Pleasant, Ohio, on 27 April 1822, Ulysses S. Grant attended the United States Military Academy at West Point, 1839-1843. After graduating he was promoted to captain while on frontier duty in the Northwest in August 1853. He resigned from the Army, July 1854 and was generally unsuccessful at farming, real estate, and clerical activities, from 1854 to 1861. Many visitors to Ulysses S. Grant National Historic Site in Missouri are surprised to learn that slaves lived and worked on the nineteenth century farm known as White Haven. During the years 1854 to 1859 Grant lived there with his wife, Julia, and their children, managing the farm for his father-in-law, Colonel Dent. At that time no one suspected that Grant would rise from obscurity to achieve the success he gained during the Civil war. Joining the army with the start of the Civil War Grant gained national attention with his victories in 1862 at Forts Henry and Donelson. In July 1863, Grant defeated the Confederate forces at Vicksburg to bring the Mississippi River under Union control. Monument to General U. S. Grant at Vicksburg. As a result of the Vicksburg victory, Grant was appointed major general in the Regular Army. In December 1863 he received the thanks of Congress and a gold medal.